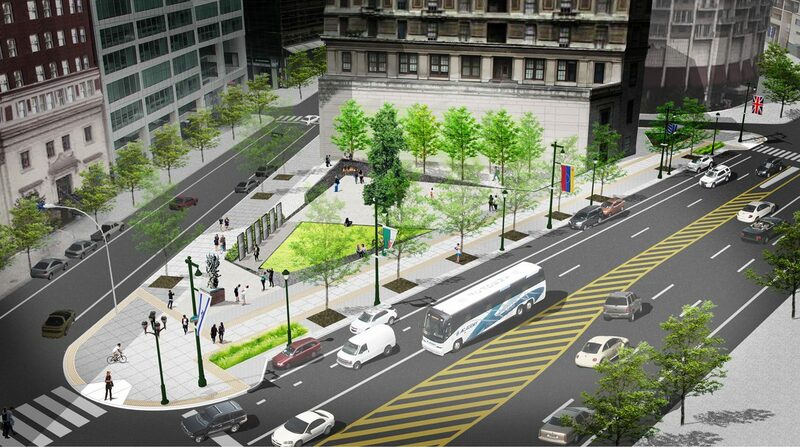 A rendering shows the proposed Holocaust Memorial Plaza at 16th Streets and the Benjamin Franklin Parkway. 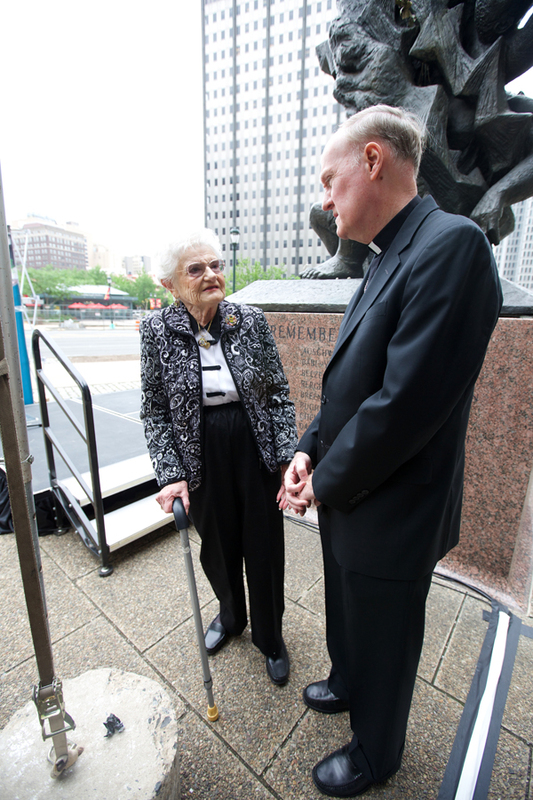 Auxiliary Bishop Michael J. Fitzgerald joined Jewish community leaders and civic officials to announce plans for a new Holocaust Memorial Plaza in center city Philadelphia May 11. Standing at the foot of the current Holocaust memorial statue, installed in 1964 as the first in North America to recognize the murder of some 6 million European Jews by the Nazis, supporters described their vision for a proposed $4.5 million proposal to transform an adjacent little-used park. Today the site next to the monument at 16th Street and the Benjamin Franklin Parkway is bordered by an elevated three-foot-high patch of grass and smattering of low trees that is occasionally used by drunks discarding their bottles and dogs allowed relief by their owners from nearby high-rise condos. After pending city approval and perhaps completion by next year, the plaza will encompass the monument and include six eight-foot-high educational panels, an eternal flame, a portion of railroad tracks that once led to a concentration camp and a row of trees symbolizing the forest in which Polish Jews escaped and mounted resistance to the Nazis. And there will be one very special tree – a full-size transplant from a cutting of a tree that was grown from seed in 1942 at the notorious Theresienstadt concentration camp in German-occupied Czechoslovakia. Obtained by a teacher in the children’s ward, the seed sprouted in the camp and each child sacrificed some of his or her daily water ration to nourish the tree. The enhanced memorial would help keep alive the memory of those who suffered and survived the Holocaust, and those who died, according to supporters. 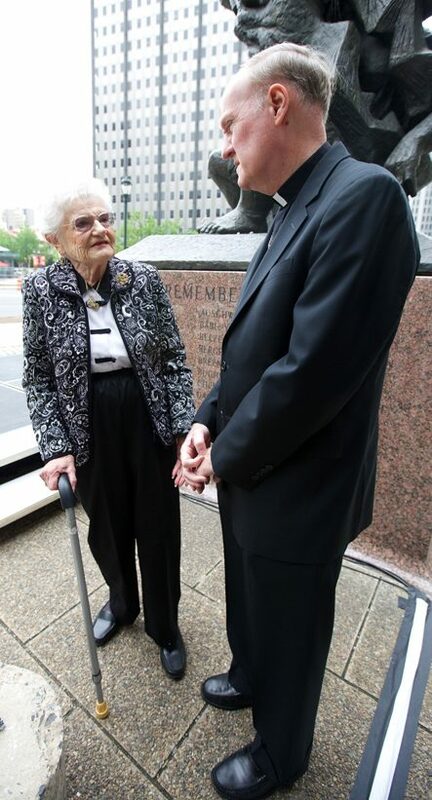 Holocaust survivor Miriam Cane said that not only was it “a blessing” to keep alive the memory of those who perished, so too was the proposed plaza. 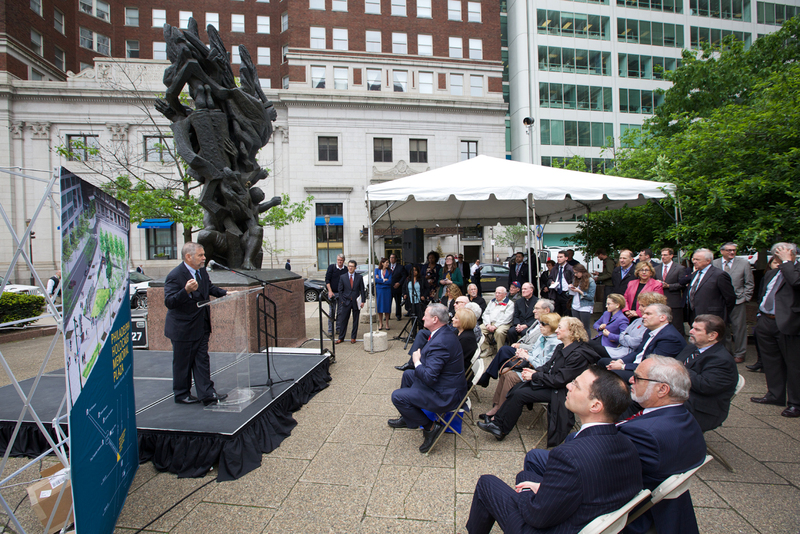 Other speakers including Philadelphia Mayor Jim Kenney and Montgomery County Commissioners Chairman Josh Shapiro noted that the survivors and their Allied liberators are succumbing to old age, and for that reason the memory of the depths of evil and the sacrifices to overcome it must be kept alive. They also pointed out that intolerance of whole groups of people and hatred based on people’s religion is again on the rise in the world. Monuments to the Holocaust help visitors to “contemplate what people are capable of,” said Kenney. While presumptive Republican presidential nominee Donald Trump’s name was never mentioned, his proposal to bar Muslims from entry into the United States struck many as a sign of a rise in intolerance and hatred, reminiscent of the Nazis. 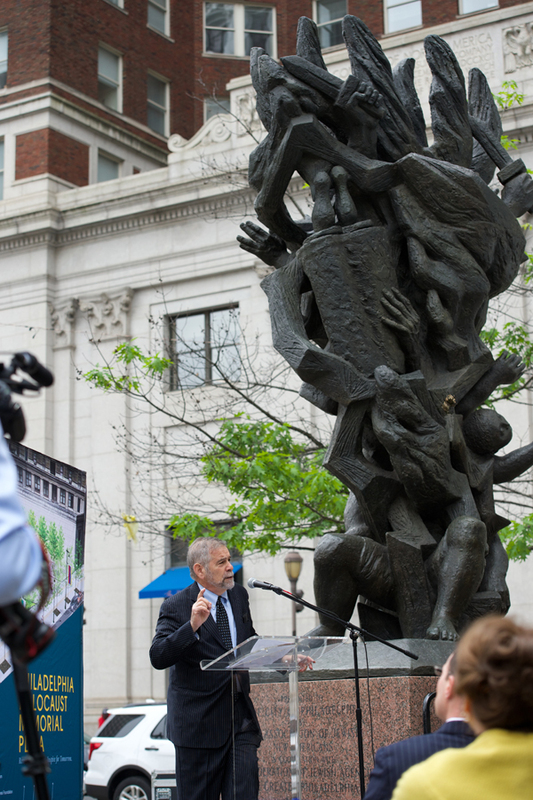 Berenbaum hoped the existing Holocaust monument and the proposed plaza would integrate the story of the Holocaust with the story of Philadelphia, the birthplace of the Constitution of the United States, as a sign of restraint on the power of government, of inalienable human rights and a governing system of checks and balances. 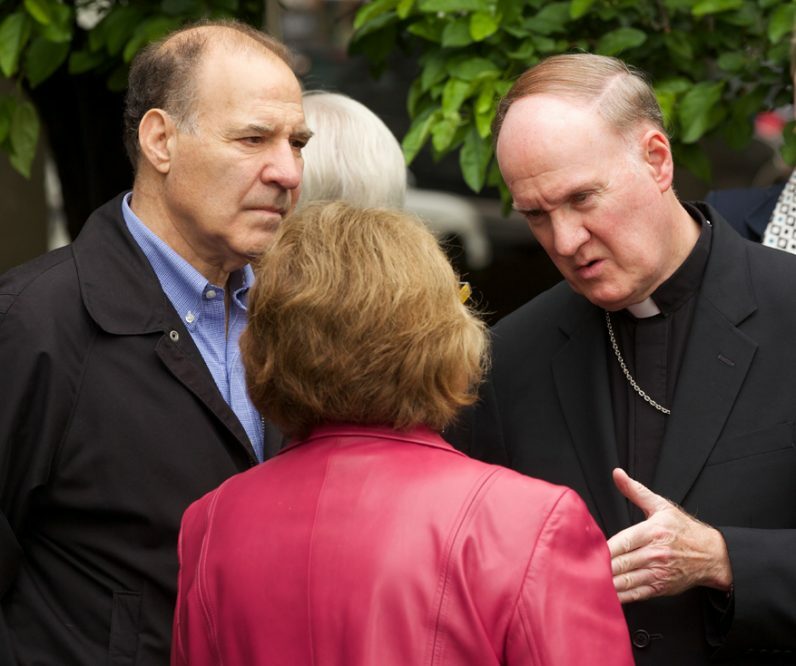 Bishop Fitzgerald, who oversees Catholic education in the Archdiocese of Philadelphia, emphasized the cooperation over a number of years between the Catholic and Jewish communities here. 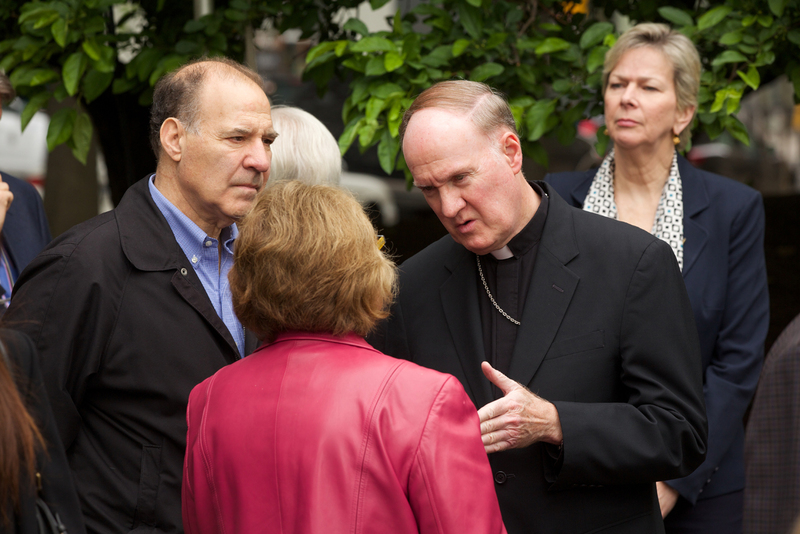 He noted the Bearing Witness program that integrates Holocaust studies into the curriculum in use at the 17 archdiocesan high schools. As terrible as the holocaust was, the number that died in the Ukraine by Russians dwarfs number killed in the holocaust.. The barbarity of man to others has been with us for many years and seems to still be with us in this day. Hitler’s Nazis murdered between 12 and 15 million innocent men women and children. Will the new Holocaust Memorial Plaza explicitly and equally include information ALL of the victims? To recognize only the 6 million Jews would be a disgrace and a form of Holocaust denial.